Introducing the new granite countertop cost estimator! Kitchen countertops are one of the main focal points of the kitchen, so the task of choosing the perfect granite color, cut, countertop edges, and a sink is extremely important and can be daunting. Adding a strict budget on top of that can cause people to panic and run from the beautiful and durable stone to cheaper, weaker materials. That’s where our new Granite Selection Cost Estimator Instant Quote tool comes in. Using our new Granite Countertop Cost Estimator Instant Quote tool is quick and easy. 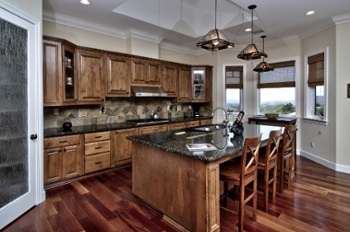 In order to approximate the cost of your granite, you first need to measure the area of your countertop. If you do not know how to appropriately measure a countertop, download our free eBook How to Measure the Area of your Countertop in Just 5 Steps or schedule a free in-home measurement appointment with one of our granite specialists. At Granite Selection, we believe that everyone deserves the kitchen countertops of his or her dreams regardless of their budget. Which is why we have built our business on the mission to supply the greatest selection of granite countertops at the most affordable prices, to help you achieve your luxury kitchen without the luxury price tag. Use this quote tool to experiment with different materials and colors to ensure that you are getting the highest quality kitchen countertop for your budget.